It’s not often that you can say there’s a buzz about Duke in football recruiting circles. But that’s the case with new coach David Cutcliffe at the controls. This week, Cutcliffe received a commitment from Sean Renfree of Notre Dame Prep in Arizona. Renfree’s high school coach, Scott Bemis, said Renfree is good enough to be the face of the Duke program in the future. Safety Jordon Byas, a Florida state champion in the 400 meters who wants to work in the medical profession one day, was next to commit. Mike Healey, who coaches Byas at Bay Senior High in Panama City, said Cutcliffe is determined to upgrade Duke’s speed. “(Byas) is excited about the new life and new thing at Duke and that they’re going to try to recruit nationally to turn that program around,” Healey said. The recent news that two Wake Forest assistant coaches have gone elsewhere means the Deacons are quickly becoming victims of their own success. A major reason Wake Forest has won 20 games in the past two seasons – the best stretch in program history – is the coaching stability fostered by head coach Jim Grobe. When Grobe arrived at Wake Forest in 2001, he brought eight assistants with him from his previous stop at Ohio. Seven of them were still with the Deacons this past season, until last week when defensive coordinator Dean Hood left to become head coach at Eastern Kentucky and quarterbacks coach Jeff Mullen went to West Virginia as offensive coordinator. That’s an uncommonly long period of time to keep a staff virtually intact. One of the most underrated indicators of success these days in college sports is coaching stability. But coaches like Mullen – who helped Riley Skinner become one of the ACC’s top quarterbacks – and Hood – who coached one of the country’s most opportunistic defenses – are bound to want to step away for something bigger at another school. It just happened later, rather than sooner, at Wake Forest. DaJuan Morgan might turn out to be a fabulous NFL free safety, but he did himself no favors by leaving N.C. State after his junior season. Morgan said the NFL draft advisory board projected him as a fourth-round pick in April’s draft. He had a chance to be selected higher if he returned for his senior season and then entered the draft. In 2007, Morgan received second-team All-ACC honors after leading the Wolfpack with 117 tackles and 13 passes broken up in a breakthrough season. With first-team All-ACC players Jamie Silva of Boston College (a 2007 senior) and Kenny Phillips of Miami (also entering the draft early) not returning, Morgan had a chance to be perhaps the premier safety in the ACC in 2008. The exposure could have helped him improve his draft status, but we’ll never know. That’s not to say leaving school early always is a mistake. When Mario Williams left after the 2005 season, it was obvious he would be a high first-round pick, and as the No. 1 pick he is poised for a fabulous career with the Houston Texans. The BCS has a lot of problems. Add Fox’s broadcasts to the list. Fox paid a reported $320 million for the right to a total of 16 BCS games (minus the Rose Bowl, televised by ABC) from 2007 to 2010. Problem is, Fox doesn’t have the rights to college games during the regular season. When you watch the college game day show on ESPN, analysts Lee Corso and Kirk Herbstreit add familiarity with the college game that you don’t get from, say, Jimmy Johnson during the halftime show on Fox. At least twice during Monday’s broadcast, play-by-play man Thom Brennaman exclaimed, “Touchdown” for Ohio State when no touchdown had been scored. Brian Robiskie dropped a pass while he was in the end zone, and Malcolm Jenkins stepped out of bounds 11 yards before reaching the goal line. The crew also did a poor job highlighting and explaining penalties, particularly LSU’s personal foul after Harry Coleman’s fourth-quarter fumble return. Charles Davis’ informative in-game analysis of Gary Crowton’s cleverly orchestrated passes to tight end Richard Dickson and Bo Pelini’s blitzes were the highlight of an otherwise shaky broadcast. It was bad enough to make you thankful for CBS, which is in the midst of a $6 billion deal for the rights to the NCAA tournament through 2014. Fox executives ought to watch closely in March and take some notes. After Miami, Virginia Tech and Boston College left the Big East for the ACC a few years ago, some college football analysts questioned whether the weakened Big East might lose its automatic bid to the Bowl Championship series. The Big East is doing fine, with three consecutive BCS wins (two by West Virginia) since the ACC expanded to 12 teams. The ACC and the Big Ten are the conferences struggling to prove they deserve their automatic BCS bids. Virginia Tech’s loss to Kansas in the Orange Bowl was the ACC’s eighth consecutive defeat in a BCS game. The ACC’s last BCS win came in the 1999 season, when Florida State stopped Michael Vick and then-Big East member Virginia Tech in the Sugar Bowl to win the BCS title. The ACC was 2-6 overall in bowls, concluding a miserable season against nonconference opponents. The ACC finished the season without a nonconference win over a team ranked in final Associated Press Top 25. Defeats of Big East co-champ Connecticut by Virginia and Wake Forest were the ACC’s most impressive wins, and the Huskies received a whopping three votes in the final AP poll. The failures of the ACC can be explained somewhat by the idea that the conference is known more for basketball than football. The Big Ten has no such excuse. Consider the Big Ten’s four BCS games over the last two seasons. Ohio State lost 38-24 to LSU and 41-14 to Florida in BCS title games. Southern California crushed Illinois 49-17 and Michigan 32-18 in consecutive Rose Bowls. All season long, Ohio State fans e-mailed claiming the Buckeyes’ defense had more speed than the 2006 defense that seemed stuck in the mud against Florida. The fans didn’t mention that when Ohio State’s defenders try to tackle, they look like Hollywood stunt men trying to hold onto the windshield of a moving vehicle. LSU’s Early Doucet bowled over would-be tacklers as if he were Larry Csonka or Jim Brown. Except Doucet is a wide receiver, not a bruising running back. It’s time to say it again. The last thing the BCS championship game needs is Ohio State matched up against a faster SEC team. That was true in the 2006 and 2007 seasons. It will be true again at the end of the 2008 season. The BCS championship game is required viewing for a reporter who covers college football for a major metropolitan newspaper. It’s just one of the things you have to do if you hold the job. If you’re a dentist, you have to fill the teeth of the patient who ordered extra onions on his sandwich at lunch. And if you’re a college football writer, you have to watch Ohio State and LSU. But to be honest, I couldn’t care less about this game, because it will be impossible to identify a true national champion after it’s over. If you’re a plumber, you have to fix the pipes that carry dirty water out of a house as well as the pipes that carry clean water into a house. UNC’s recruiting. So far, North Carolina has a small and relatively unimpressive class. But coach Butch Davis closed his first Tar Heel class with a remarkable February surge, and it will be interesting to see if he can repeat that feat. Mike Glennon. N.C. State’s incoming freshman quarterback was named his team’s most valuable player Saturday in the Under Armour all-star game in Orlando. Chantilly, Va., native Glennon may be good enough to play immediately for a team that needs better quarterback play. Clemson-bound defensive end DaQuan Bowers also will be a player to watch after he was named his team’s MVP in the same game. Bobby Bowden. Florida State’s legendary coach might be tarnishing his legacy as he tries to stay ahead of buddy Joe Paterno atop the career victories list. Now the team’s academic scandal joins “Free Shoes University” as a blemish on Bowden’s record. And the school’s goofy succession plan for offensive coordinator Jimbo Fisher to take over when Bowden retires concentrates far too much power in the hands of an assistant. The ACC championship game. A crowd of more than 50,000 for Wake Forest and Connecticut in the Meineke Car Care Bowl provided more evidence that Charlotte has a shot at getting this game on a permanent basis after it plays host in 2010 and 2011. Tampa gets it first in 2008 and 2009, but it’s difficult to imagine the game thriving in Florida after Jacksonville’s attendance decline from 2005-07.As for Ohio State-LSU, it’s been proposed that college administrators would be forced to implement a playoff if we damage the BCS TV ratings by watching something else tonight. If only I could. As of Dec. 1, Bill Stewart’s only head coaching experience was an 8-25 stint at Virginia Military Institute from 1994-96. How does a guy with that kind of record land the West Virginia job? By pummeling Oklahoma 48-28 in the Fiesta Bowl as interim coach, as Stewart did Wednesday after Rich Rodriguez left for Michigan. The immediate benefit to hiring Stewart was obvious on the field in Tempe, Ariz. Stewart was Rodriguez’s associate head coach and has coached tight ends and quarterbacks at West Virginia, so he is equipped to keep the read option offense moving forward. 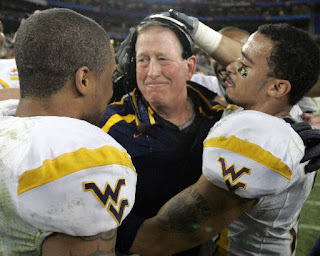 With quarterback Patrick White and tailback Steve Slaton scheduled to return in the same system, the Mountaineers immediately become a favorite to reach their third BCS game in four seasons now that the “interim” tag has been removed from Stewart’s title. The hire will be popular with players and should keep a talented nucleus in place. But in terms of the long-term future, hiring Stewart is risky because he doesn’t have a proven track record as a head coach. Stewart’s ability to build a strong staff and recruit are unproven. This hire has the feel of Carl Torbush’s replacement of Mack Brown at North Carolina, and we all know how that turned out. You tune in to the McDonald’s All-America basketball game expecting to see the next generation of players headed to North Carolina schools. That’s not always so with national high school all-star football games because Carolinas schools don’t regularly compete with Ohio State, Texas and Notre Dame for top football recruits. Charlotte Latin’s Braden Hanson, who’s committed to North Carolina. Mike Glennon of Westfield, Va., rated the nation’s No. 4 dropback QB by rivals.com, an N.C. State commitment. Clemson commitment Kyle Parker of Jacksonville, Fla.
What does this mean for the Carolinas schools? The other quarterbacks in the game are committed to Florida, Florida State, Miami, Oklahoma, Texas and UCLA. Those are traditionally strong, national-caliber programs, and having quarterbacks in the same class as those schools is an indication that football in the Carolinas is strengthening. The all-star roster attests to Clemson’s strong recruiting class. The Tigers also have commitments from DT Daquan Bowers (Bamberg, S.C.), CB Xavier Brewer (Jacksonville, Fla.) and RB Andre Ellington (Moncks Corner, S.C.), who are scheduled to play. Clemson also has the only Carolinas commitment in the U.S. Army All-America game (1 p.m. Saturday, NBC) in OG A.J. Harmon of Louisville, Ga. In addition to Hanson, the Charlotte area is represented in both all-star games by Butler High safeties. Spencer Adams, who’s undecided on a college, is at the Under Armour game. Notre Dame commitment Robert Blanton is at the U.S. Army game. Michigan’s 524-yard effort in a 41-35 Capital One Bowl defeat of Florida was more than a farewell gift to coach Lloyd Carr. If Carr was pleased, Fox TV executives ought to be downright thrilled with the outcome of that game because it adds drama to Monday’s Ohio State-LSU meeting in the BCS championship game. Before New Year’s Day, top Big Ten teams hadn’t demonstrated they could handle speedy teams from the Southeast. Florida’s rout of Ohio State in the BCS championship game last year and Appalachian State’s stunner at Michigan severely damaged the Big Ten’s reputation. By running circles around the Florida defense, Michigan raised the Big Ten’s profile and instantly made Ohio State-LSU more appealing. - In another SEC-Big Ten meeting, new Duke head coach David Cutcliffe gave the Blue Devils reason to be excited in his final game as Tennessee’s offensive coordinator. Under Cutcliffe’s direction, Erik Ainge passed for 365 yards in a 21-17 win against Wisconsin in the Outback Bowl. College football history is full of examples of departing coaches who bumbled their way through bowl losses when they stayed around to coach their old teams. Mark Richt, who’s turned out to be an excellent head coach at Georgia, might have set the standard in the Orange Bowl in January of 2001. He stayed to work as Florida State’s offensive coordinator, and Florida State lost 13-2 to Oklahoma with the national title on the line. Cutcliffe fared much better. After saying his plan for Wisconsin was in place when he was hired at Duke, Cutcliffe wound up with a win, impressive numbers for Ainge and extra publicity for Duke. - I gained respect for former San Diego Chargers quarterback Dan Fouts while listening to him work the Holiday Bowl on the radio and the Armed Forces Bowl on television. Unlike most former jocks, Fouts calls play-by-play rather than providing color analysis. That’s not an easy job, and Fouts does it well, sprinkling in informed opinions while telling viewers what’s going on in the game. - Though the college coaching carousel isn’t done turning yet, it’s surprising that the name of East Carolina’s Skip Holtz hasn’t been mentioned much in connection with jobs in BCS conferences. Arkansas, Georgia Tech and West Virginia would have been three logical places for Holtz to receive consideration. But if he doesn’t get it after this season, adding a Hawaii Bowl win to his resume before the holidays only will enhance his attractiveness in future years. - ACC fans surely have noticed the conference’s losing bowl record. Virginia’s 31-28 loss to Texas Tech in the Gator Bowl dropped the ACC to 2-5 in bowl season. The season included news of a huge academic scandal at Florida State that didn’t help the image of that school or the league. - The ACC can take some consolation, though, in the fact that four of the losses came by margins of seven points or fewer, with Virginia Tech still to play Kansas in Thursday’s Orange Bowl.